I had an odd experience this morning, as I occasionally do while dreaming. This has happened a few times–there is a palpable sensation of something shifting inside one’s body, which shifts your level of awareness while dreaming. This morning, it was to go from regular dreaming into lucidity, but the shift was so sudden that I went into a black space. I stayed calm, trying to examine the space (there seemed to be a green face to my right), but instead, the wake-up call arrived, and I then experienced the heaviness of being back in a body and having to fit myself in it. This shift into lucidity has happened at least once before–and it’s felt like it is the heart area which moves, instead of a mental and slow realisation, which I’ve also had before. The shift is a real sensation. The most dramatic and clear of these experiences was a dream I once had during a dawn-time eclipse (partial solar, I think). I was having a warm conversation with someone, and when it was over, I didn’t awaken, but felt, in the dream, as if I was tipped/shifted/rotated 90-degrees (somehow important) to re-enter waking reality in an instant. So there was no break in consciousness from one place in another, but the astounding memory of what had just happened, and how it was completely new to me. I guess it’s not so much, now! The shifting has taught me pay attention to whatever I was dreaming/doing just before. This morning’s dream was pleasant; I was taking writing lessons from a friendly and somehow familiar female instructor, who was also showing us an entertaining video about bees surviving creatively in urban spaces. We could hear their conversations and how they gave faux Latin botanical names to mass-produced human objects. I laughed. At the same time, addressing me directly, the instructor said “Be brave!” (I noted it down after I woke up: “BEE Brave?”) Walking the kid to school this morning, the brightest thing that greeted us when we arrived was someone’s bright “bee” backpack hanging on a scooter. Its owner was elsewhere, and the bag being at the center of the entrance (at a place for learning) was unusual and seemed “in your face”. 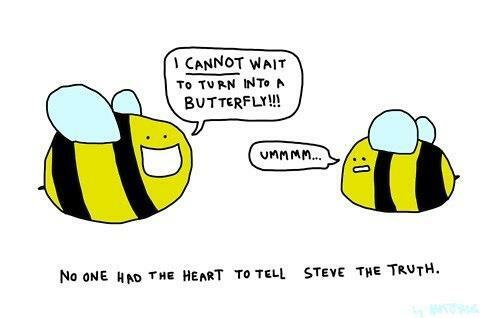 Well, I go now to be a (brave) busy bee, then!